ACME Fine Art will open the Fall season with an exhibition of large and important canvases by the Figurative Expressionist master, Lester Johnson. The exhibition, titled Lester Johnson: Classical Themes, will open on Friday, 19 September, and will be on view through Saturday, 25 October 2014. A reception in conjunction with SoWa’s First Friday festivities will be held on Friday, 3 October between 5:00 and 8:00 in the evening. This will be ACME Fine Art’s fourth solo exhibition of Lester Johnson’s work and it will feature nine seminal oil paintings from what was a pivotal decade for Johnson: the 1960s. During the 1960s the Martha Jackson Gallery in New York, and the H.C.E. and the Sun Galleries in Provincetown were frequent venues for Johnson’s contemporary work. It was also during this decade that Johnson’s paintings were selected for inclusion in groundbreaking exhibitions at the Smithsonian Institution, the Museum of Modern Art, and the Whitney Museum of American Art. His canvases from this period are bold and vigorously expressive regardless of scale, and they demonstrate a poetic virtuosity that became Lester Johnson’s hallmark. The paintings selected by Gallery Director David Cowan for this exhibition demonstrate the artist’s interest in classical art and architecture, and they collectively display this thematic thread in Johnson’s paintings from the specific period between 1964 and 1968. Johnson’s interest in classical form can be seen in subject matter, in such paintings as Polykliton Figure, and his brilliant series of Three Graces canvases, and in structural form in monumental paintings such as Milford Bathers, Silhouette and Archway. Despite the artist’s use of and reference to the antique in these works, it would be a mistake to view them as anything other than trailblazing statements in the Figurative Expressionist movement. 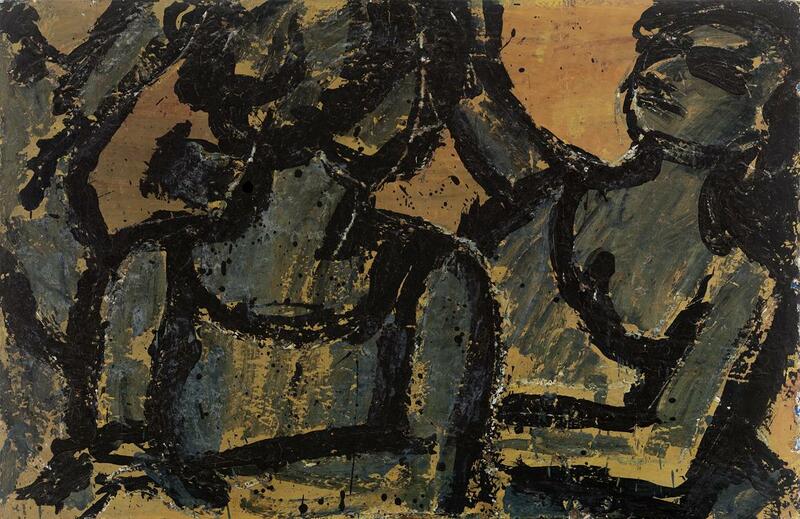 Lester Johnson is one of a handful of avant-garde artists who abandoned non-figurative painting in the 1950s in order to harness the power of the human figure as a primary vehicle for artistic self-expression. Today, Johnson is recognized as one of the most important and influential painters of his generation. 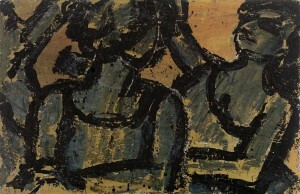 Since his first solo exhibition at New York’s Artists Gallery in 1951, Johnson’s work has been featured in more than 100 solo exhibitions, and included in important group exhibitions at the Pennsylvania Academy of Fine Arts, Whitney Museum of American Art, Solomon R. Guggenheim Museum, Museum of Modern Art, Art Institute of Chicago, and the Museum of Fine Arts, Boston, to name just a few. Lester Johnson’s work is in the permanent public collections of the Metropolitan Museum of Art, Museum of Modern Art, National Museum of American Art, Solomon R. Guggenheim Museum, Carnegie Museum of Art, and the Fogg Art Museum at Harvard University. Exhibition catalogues are available through the gallery, and the entire exhibition is viewable on line both at www.acmefineart.com and at ACME Fine Art’s ARTSY web site. For more information about the exhibition or the artist please contact the gallery at info@acmefineart.com or 617.585.9551.